Lull your baby to sleep with this Sweet Jojo Designs down-alternative crib comforter. Made with soft and cozy fabrics, it uses sterilized hypo-allergenic down-alternative fill. 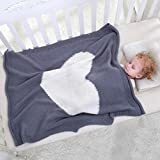 What a wonderful blanket for your little one!